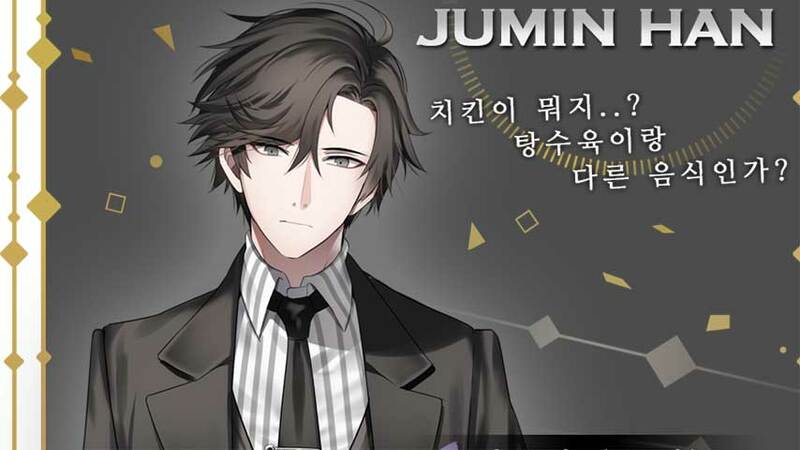 This Mystic Messenger Jumin walkthrough will ensure you gather the maximum possible hearts from the stoic CEO-in-line. Mystic Messenger always starts off with four shared days before locking you into a character route. If you want to make sure you see the Jumin route at the end of this period, this walkthrough of the Prologue, Day 1, Day 2, Day and Day 4 is all you need. Jumin is only available in Deep story mode. If you are playing Mystic Messenger in Casual Story mode, you cannot secure his route. You will need to return to the main menu and open the save and load menu to navigate to the mode select screen to choose Deep Story mode, which costs 80 HG to unlock. Once you’re in Mystic Messenger’s Deep Story mode, all you need to do is follow our walkthrough below to end up on Jumin’s route – easy! This walkthrough has four goals: to earn the maximum Jumin hearts so as to secure his route; to avoid earning 707 hearts for the same reason; to earn as many general hearts as we can; and to unlock every possible Mystic Messenger guest via email invitations along the way. As such, we’ve only listed those chats where these goals apply. You can skip the others if you like, although you should be careful to keep your daily participation about 60%. Where we don’t provide walkthrough, just remember to avoid earning 707’s hearts and butter up absolutely everyone else. 707 is the only character you can accidentally end up with in Deep Story, so go bananas on the others if you like. We’ll have more Mystic Messenger Jumin resources soon. In the meantime, return to our Mystic Messenger guide and walkthrough hub for other tips and pointers. 2: I came here while chatting with a personal called ‘Unknown’. Do you know him by chance? 12: Alright. It looks fun. I’ll give it a go. 2: But Jumin, don’t you have to go to work? 5: Isn’t it natural to just work as much as you get paid? 3: Ya. I’ll have to be careful. 4: Seven, what do you do? 5: Have you been here? 2: Is that a threat? 3: Don’t worry. I’ll do a good job. 4: I’ll try my best. 5: I’d like to do something meaningful. 3: What is your worth, Jumin? 4: I first intend to try my best. 5: If I try my best, then everything will be good. 6: Tell your cat hello, Jumin. 1: It’s a beautiful evening. 4: I plan to do my best. 1: Jaehee, you’re still awake. 2: I plan to try my best. 3: I’m curious of Jumin. 5: You must really cherish her. Is there a particular reason? 6: That sounds like a good idea… it’ll be so cute! 8: Wow, an organization that protects street cats? That’s a good idea! 1: Did you sleep well, Jaehee? 3: Don’t you think it will be fun? 4: It’s good for Jumin to have fun at work. He just has to pay his workers properly. 6: Just wear a mask next time. 7: To be honest… I actually want to see her. 8: I think that’s a good idea. More and more people are allergic these days. Tell him to contact me. 11: Wow. You have meetings with directors? So cool! 1: What’s going on? Are you okay? 4: Why do you ask? 5: I’ve lead an honest life so far. 8: Don’t look for it. It’s disgusting. 10: You have a maid? You must be well-off. 1: Jumin, did you have lunch? 2: Well…! I should get some steak and wine now! 5: Am I really safe? 10: So no one knows where Luciel works? 11: Jumin, you’re so considerate! 12: So cool to see Jumin be the rich man he is! 13: I guess businessmen really do think differently. 14: I think it’s a good idea! Tell them to contact me. 15: It was fun talking to you, Yoosung. Bye! 16: Yup! Good luck, Jumin! 5: It took me a while to find it too. 6: Jumin, you must really like this chat room. 7: If everyone just respects each other’s privacy, I don’t think there will be any problem. 8: Why is she avoiding talking with Jumin? 10: Really? Then that’s a bit unfair. 11: Why don’t you two peacefully call a truce on each other…? 12: lololololol Jumin’s so funny. 13: I’m not hurt at all. Jumin says funny things, haha. 14: OMGOMG Make sure you send me a selfie!! 1: Yoosung, I missed you! 2: It was a bit funny to watch actually, haha. 3: Apparently, that’s what statistics say. I guess you know women pretty well. 4: Cheer up. You still have hope! 5: To be honest, I can’t believe that you’ve never had a girlfriend before. 7: I’ll eat with you in spirit! Yum yum. 3: lol He totally caught you. 4: I think your question has to be more specific. 6: I really think it’s rude to ask something like that. And he doesn’t have to answer it. 7: I don’t think he’s gay. 8: I am actually sleepy. 1: Wow Zen, I missed ya. 2: Well I guess Jumin has his own aura. 3: Hmm. I think Jumin has a more sophisticated world of his own, so I’m not sure if he’ll need your advice. 4: But you were always considerate towards women… So cool! 1: OMG! Jaehee! Zen was in a motorcycle gang! 2: I don’t think he is. 3: I think you’re jumping to conclusions. 4: I think Jumin will open up once he finds someone he likes. 8: Since we’re alone here, I want to ask you something. Is Jumin… the heir? 9: Do you really think Jumin has no chance of finding someone he loves? 10: So he really cares for animals. There is one Jumin heart in this chat, but it’s not really worth the effort; it’s a very long chat at an awkward time. We suggest skipping this one, as a single heart will not mean the difference between success and failure with Jumin. 1: Hi, Jaehee! How about you? 2: OMGOMG >0< Zen Zen Zen!! My lovely Zen! 5: I think Jumin’s logged in right now. No? 8: What an elegant schedule. 9: I think Jumin’s a bit flustered. 10: I think cat businesses will be really fun to work on. 11: How short they last…? 12: OMG >_< It’s still so cute! 14: Did something happen between Jumin and his father? 15: Me too! Sleep tight! 1: Hi, Jaehee! ^^ Did you get to work okay? 2: You have to eat properly too. If you just stuff your stomach with whatever because you’re busy, it won’t be good. 4: Does he not get along with his father? 6: I probably would have felt the same way in his shoes. 7: …Your love life will blossom one day! Cheer up! 9: Oh no T_T I’m sorry. 11: Hearing you say that is making me really sad. 2: It must be uncomfortable for him. Will he be okay? 3: Jumin, how did the lunch go? 6: Your cars didn’t seem to be economical. 7: But can you chat with us when you’re having lunch with your father? 8: You must be very uncomfortable right now. 9: No I do not. I do not have the time to watch television. 12: The photo wasn’t great but I don’t think Jumin can be perfect at everything. 14: You mean “Melanie” steak. 15: You’re going to get stupid if you eat that too much. 17: Wouldn’t it be polite to turn your phone off now? 18: Just because he’s his son, it doesn’t mean they have to be alike. 2: Isn’t kind of cute though, that Jumin takes really bad photos…? 3: Isn’t there something fishy about Seven? 5: I want to know too!!! 10: Hmm. I think that’s just a prejudice. 11: I’m sure Jumin has his own struggles. 13: Isn’t it a bit unfair to draw the line like that just because he was born in a different environment…? 15: But aren’t you going to school? 17: You’ll be okay, Jaehee! 4: Jumin, do you eat properly? 5: What do you mean? 6: I guess Jumin has his own reasons. 7: I guess he’s a good father. 9: It was really kind of him. 10: It’s on a totally different scale… but it’s nice that you give gifts to each other. 11: I may sound a bit uptight, but you have to be careful of comparing women to objects. 12: Oh~ New information! Jumin knows everything. 14: I’m sure he has other issues. No one’s life is that simple. 15: Maybe you should be careful to bring it up since it’s a sensitive topic? 16: …Really? Well, sorry to hear that. 17: Go and rest! Don’t get too stressed out, Jumin. 18: I feel like Jumin will have his own problems just like everyone else. 19: But don’t you think Jumin’s passionate about his work too? 20: Good bye, Zen~ Good luck today! I really hope to see you on stage some day. 1: Well, I’m craving your pheromone more than dinner, Zen. 2: Zen, how about you? 3: I’m not curious either. 5: Could you please give us a warning? You surprised me. 7: I see some contradiction there. 8: So… What did you do? 9: …;;I just feel like you’re doing whatever to get more money? 10: Talking about racing reminds me of when Zen was in a motorcycle gang. 11: lololol Not really convincing? 13: No… You didn’t steal the whole thing, did you? 14: I don’t think it was right that you were paid with chips instead of actual money. 3: If you just tell us everything, Yoosung won’t have to worry anymore. 4: You guys seem very close. 5: I don’t feel pressured at all. Everyone’s being nice, especially Jumin. 6: I’d love to get close to you one day just like V is, Jumin. 7: I think it’s okay to be interested. Maybe she might be a good person. 9: Please set it asap for everyone. I think Yoosung’s having a hard time. 11: Don’t forget to set the date. Yoosung and I are waiting desperately! 13: Yes. I’m glad I got to see a new side of you today. I’ll be able to sleep well tonight. 1: Hello. It’s a nice evening today. 3: Yoosung did make a bit of a fuss. 5: I do… but we’re not close anymore. 6: I’m jealous of V… I’d like to get more comfortable with Jumin too. 7: Yeah right. I don’t think so. 2: He might be lying. 4: It’s kind of convincing! 5: I want it all. 7: Anyway, V was here. I’m just gonna stay up a bit more ^^ Have fun! 3: Oh, right. Did Jumin leave for work? 5: I don’t think Jumin will be happy about this… I’m worried. 6: Well, since it is the chairman of a huge corporate, I guess that’s possible. 7: Jumin’s so lucky to have such a capable assistant. 9: Hmm. That’s true. Shouldn’t he be banned from having an outside in his home? 13: Please get something to eat at work. 16: Good luck! I’ll look forward to good news! 3: Is it like having your secret revealed? 4: Oh! That’s actually a pretty good guess. 6: Did you go to work, Jumin? 7: I think Zen just wants to know whether she’s actually a woman or not. 10: Jumin, don’t you get lonely if you only meet people for work? 11: I understand that Elizabeth 3rd is important to you, but I think it’ll be nice if you get to know others too. 13: At times, ignorance is bliss. 14: Yeah, I thought the name Luciel was a bit too cartoonish. 16: I think he does? 17: Is there a reason why? 20: Gaming is the best way to do that! 22: Elizabeth 3rd will be lonely if you go. Have a good trip. 24: Bye, Yoosung~ Make sure you don’t skip lunch! 4: Just don’t even expect it~ He really seems like a strange person. 5: Are you really religious? 7: Seven, it’s not polite to ask a woman that. 8: Jaehee… So sorry that you have so much work. Cheer up. 9: You still haven’t reported him? 10: Ooh, I’m looking forward to it. lol What kind of project is it? 11: Don’t bother Jaehee so much T_T She’s stressed enough already. 12: I’ll pray so that you can get some rest soon. 15: I don’t think you’re sincere. 16: Laterz~! Jaehee, see you later. 18: You’re amazing… I hope you don’t get any more work. 2: That’s unfortunate. A new role would have been better. 3: You were on a subway? That’s modest! 5: I guess you don’t really care. 6: Why do you have bad memories with your family? 8: I like people like you make others happy, more than those who make a lot of money. 1: What’s up with the cuteness? 2: Don’t even think about posting it if you don’t have Zen’s looks. 3: You do wash your hair, right? 4: You just made that up right? 5: … So you’re a cockroach? 9: Zen, getting all the spotlight in the world! It’ll be so cool! 2: Run like the wind! 11: Please say hello to Elizabeth for me! 12: The best man for a woman? 13: Good luck! Until the day you rule the LOLOL world~! 1: Huh? Isn’t Jumin here too? 2: Maybe because you’re just not good at it? Be efficient like Jaehee. 4: Did you reunite with Elizabeth 3rd? It must have been so hard to stay away! 5: But why did you go to the farm? 6: Yeah. I don’t really like the pretense shots. 7: Wow! Just looking at it makes me feel better. 10: I think it’s be nice if you can develop a wine Elizabeth 3rd can drink. 11: Jumin~ I hope it helps your company. 13: Maybe you can just tell Seven how he should play with your cat? 16: Elizabeth must be such a happy cat to have such a great protector. 1: Hello, Jumin! Wine that cats can drink! It’s such a great idea! 2: OMG so cute! >_< !!! 3: But will it produce profit? 5: I guess you really love cats Jumin~ You even took it to the party. 10: She’s his pet. So what if he’s a bit obsessed? 11: Jumin… are you okay? 12:Okay! I hope the project comes to fruition! 14: Bye! Put a photo of Elizabeth 3rd on the running machine so you can get used to cats. 3: The screen sensor will have to work with cat paws. 6: Can we get everything read in a week? Yoosung will get worried again. 8: Everyone’s been helping me a lot. 10: I think you’re the more important once since you decide everything. 11: I’m a bit nervous but I’ll have to try my best. 12: Hmm… You’re not worried about anything, are you? Seven, I’m safe, right? 13: You’re not breaking your promise, right? Yoosung and I will be watching. 14: Yup. Everyone has to do their jobs!